That’s a nickname someone gave me because I reminded them of a bear, mostly because I can sleep anywhere, and when I am asleep I look like I’m hibernating… don’t try to wake me up even if it is for my own good or you’ll find out the other reasons why I received this nickname. But don’t worry, I don’t usually fall asleep on my blog. Speaking of my blog… Welcome to my cyber home! Here you will find the scribblings which erupt from me. I write in the style of my thinking – I’m a tangential thinker, which is apparently a disorder, luckily I’m not too keen on orders. I talk this way too, when I can actually be bothered to talk. Translating my thoughts into verbal utterances is not always a good idea, at least that’s the impression I get from those who hear my words… then run away covering their ears, screaming… or maybe they’re singing. I can be rather blunt. Sometimes I’m just odd (I am very weird and very crazy). I’m an INTP… according to MBTI. I love exploring different ways of perceiving things, and people, and life. You’ll find a mishmash of all sorts on here. 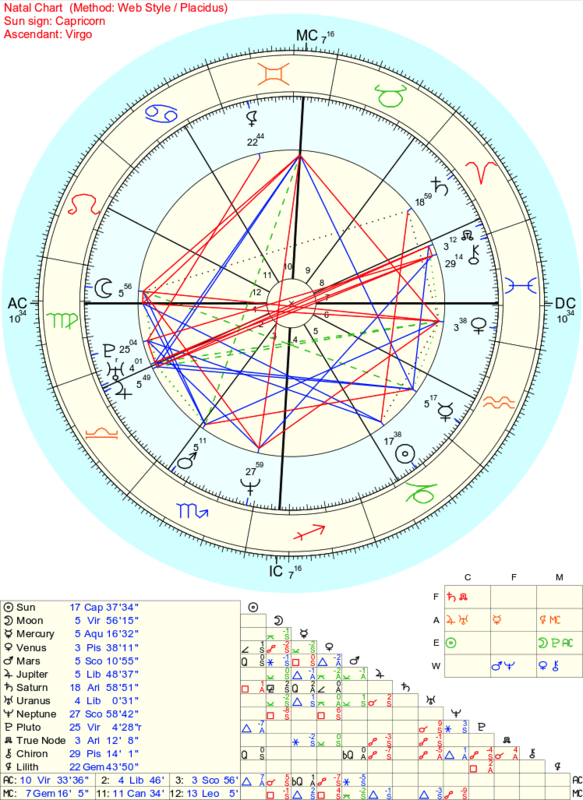 You can find my astrology chart here. I am a Capricorn Sun, but that’s not the part with which you need to be concerned (some people think all Capricorns are sociopaths), it’s Pluto and Uranus located in the 1st house which is far more disturbing. I call them Death Stares and Fruit Loops, which explains everything – you’ll either love me or hate me or both at the same time. The latter sums up how I feel about myself. I am an ACoN – Adult Child of Narcissists. I’ve written about my experiences, some people relate to what I’ve expressed, others think that I don’t know what I’m talking about. I often don’t know what I’m talking about either, confusion is a familiar destination for me. I have sexdaily, otherwise known as dyslexia. It affects more than just the ability to read and write, and causes those with it to develop some interesting skills (eg. I have to triple-check what I read and hear, and this can be useful for spotting lying liars who lie). …rants, humour (at least I think it’s funny), musings, things which make me go hmmm, philosophy, dreams, memories, TV & Film, Video games, books, and a plethora of other things, sometimes fluffy, sometimes spiky, sometimes just odd (very weird and very crazy). Oh, and I make a lot of mistakes… I’m a mistake-making mess of a human (yes, I’m fairly certain I’m human), and it’s fun! This is a very self-indulgent blog. It changes from time to time… it flows with me. I flow back-to-front, upside down, topsy turvy, and any which way except the way that I’m supposed to go. Thank you for visiting, and may your journey through life take you on many wonderful adventures! I tried to think up a witty response but all I got was – this is fabulous. I’ve removed your ps. with your contact details (but have saved them) as this blog is open to the public and anyone can read the comments. At the moment I only communicate via comments on my blog, so there is no contact form or anything to find. I have been considering adding an email for people to contact me privately, but I’ve been considering that for a couple of years and haven’t done it yet, so I’ll probably keep dithering about it. If you’re open to and okay with chatting via comments, that’s great, we can comment-chat here on my About page or on the post you mentioned which resonated with you. Ask or share anything you want. Just keep in mind the comments are public.